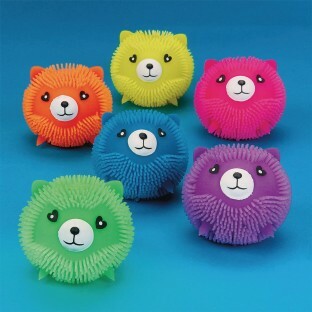 Soft Animals Puff Out With Each Squeeze! Great for toss and catch games. Also amazing tactile stress relief! Short soft strands are easy pinch and grip. Soft, squishy, air-filled silicone animals puff out with every squeeze! Great for all sorts of toss and catch games and tactile stress relief. Short soft strands are easy pinch and grip. Approx. 2-1/2". Assorted colors. Latex Free. Set of 6. We hand these out to anxious patients on our unit. Squeezing the ball and being reminded of a furry friend helps to calm people who a scared or anxious. My daughter loves them and named each one. Daughter loves them. Easy to take along to Grandma's. Loves the squishy. Would be nice if they lit up like other comparable toys.